These days, nurses enjoy an abundance of opportunities and tremendous variety in terms of where they work and what they do, from choosing the kind of medical facility they want to work in to deciding what specialty they want to pursue. There are even more options for nurses who decide to further their education and enter advanced practice as nurse practitioners (NPs). Thanks and I hope you all have a great rest of your day! Nurse practitioners are advanced practice registered nurses (APRNs) that hold advanced degrees, either aÂ Master of Science in Nursing (MSN)Â or aÂ Doctor of Nursing Practice (DNP). This means they have considerably more job responsibilities than aÂ registered nurse, so it makes sense that their salaries and job requirements would differ. According toÂ AANP, 95.1% of nurse practitioners have a graduate degree and 86.5% maintain their national certification on an ongoing basis. If you want to be an NP it’s important toÂ know what steps to take to get there. Though this will vary somewhat based on your location since some individual states specify certain unique requirements, the universally recognized path involves earning a post-bachelor’s degree, national certification, and state licensure as an advanced practice RN. Now you’re likely wondering, âwhat kind of salary can I expect to earn in my state?’ The U.S. Bureau of Labor Statistics provides everything from employment trends to salary data for each state. If you’re looking to isolate the salary potential for NPs certified in a particular patient population focus or specialty, you’ll find it helpful to look at the current job listings for the career path you intend to take. Sites likeÂ USAjobs.govÂ are usually a good starting point. Here you’ll find an illustration that shows where the highest number of NPs are concentrated in the US, along with salary information and employment distribution by industry as provided by the U.S. Bureau of Labor Statistics. 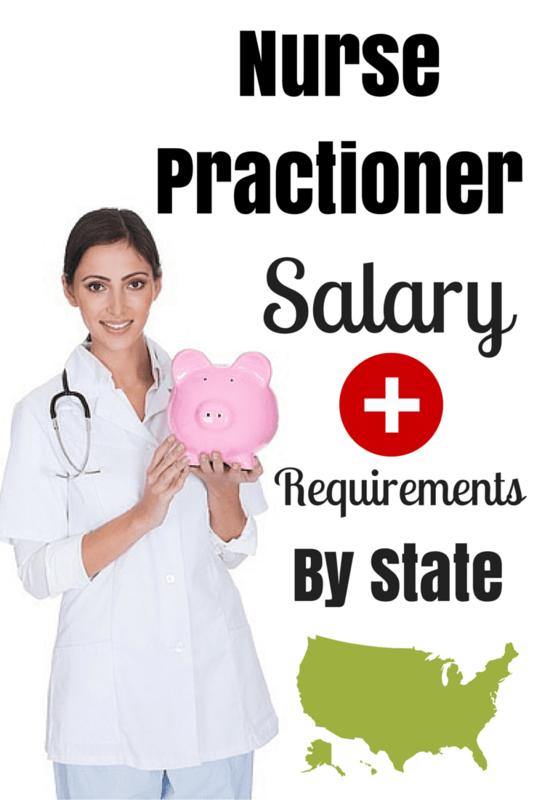 The following is a list of requirements for Nurse Practitioners by state. Salary data for this set was sourced from U.S. Bureau of Labor Statistics. Do you think becoming an NP is the way to go? As you can see, salaries can vary widely depending on the state, but it’s important to keep in mind that the numbers above are only averages. In addition, the cost of living will vary based on city and state as well. If you still need more information about nursing education, check out all the types of degrees nurses can get. AANP is the American Association of Nurse Practitioners and offers a wonderful brochure for those just considering NP as a speciality.